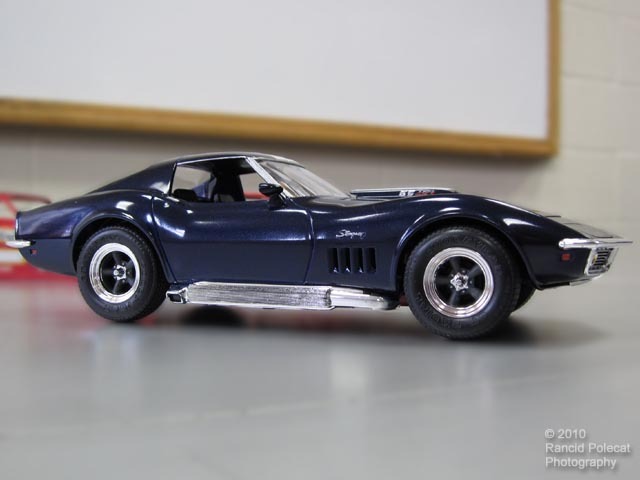 Kenny's 1969 Baldwin-Motion Corvette is a box stock build from a Revell kit. He selected this subject out of his enthusiam for muscle cars and the Baldwin-Motion series of Camaros and Corvettes. When he started it about 1993, Kenny took care of the basics; painting and assembling the frame, suspension, wheels, tires, frame, and engine. After bringing it out of storage, he completed the rest of the build in about two months. He had to paint and detail both the body and interior then perform the final assembly. Incredibly, after seventeen years, not one part was unaccounted for.